Discussion in 'KA-BAR Knives' started by meabunaitoo, Apr 13, 2019. I have a military Kabar that is missing the pommel. I would like an original military one. Any idea where I might a replacement???? I did see that site. I'd rather find an old one from an original. That one is an original military one. Without pictures or a date of manufacture it is impossible for us to know what you are looking for. Or from what era. I'll take some pictures, and see if I can figure out how to post them. If the one listed isn’t the one you want. Anything else will be pretty hard to find without buying a donor knife. Then the problem will be getting it off without ruining it. Tanker 1/66 and Lapedog like this. The one presently available from KA-BAR is NOT an original military issue pommel. The available pommels are thick pommels with a pin hole halfway through them. NONE of the original MK2 knives by KA-BAR with the thick pommels had any pins in them at all, they were peened on. No KA-BAR MK2s have been purchased by the US military since WW2. The other problem would be that if his knife is a later model one which did have a pinned on pommel, but those pommels were thinner than the ones currently available. There are plenty of really bad condition MK2s out there to take a pommel from, or one could have a machinist turn one out. Naturally it would be good to see a photo of the knife. bikerector, Tanker 1/66 and eveled like this. Sorry for the misinformation. I forget that mine came from the px and was not actually issued. bikerector and Tanker 1/66 like this. How do I add a picture to this post???? I want to download them from the computer. New camera is junk. nikon coolplx. Old Samsung was way better. First thing I should find out is, is it a real KaBar???? Next, is it worth fixing???? Click on upload a file and pick a pic to add. The only hang up is the size of the file. I usually crop the picture instead of shrinking the whole thing. A picture will help a lot. There are lots of original ww2 knives called KaBar’s that aren’t KaBar made. If it’s from that era it is worth saving. Question will be wether to just preserve it or to restore it. Or somewhere in between. I'm not a paid member, so I guess I can't post pictures. One side is marked USMC. The Robeson USMC is the rarest of the WW2 MK2s. They were also known for breaking pommels off. I think you can post photos even if you're not a paid member, you just have to use a photo hosting site to do so. With a missing pommel there must also be some missing tang in all I have seen. To repair it would require removing the handle to weld on a new end on the tang and then have a pommel made up and peened on. Gunsil, were the USN knives guard marked RCC also made by Robeson? If so how come they had pinned pommels and the USMC knives were penned? Yes, MK2s marked RCC on the guard are also Robesons. 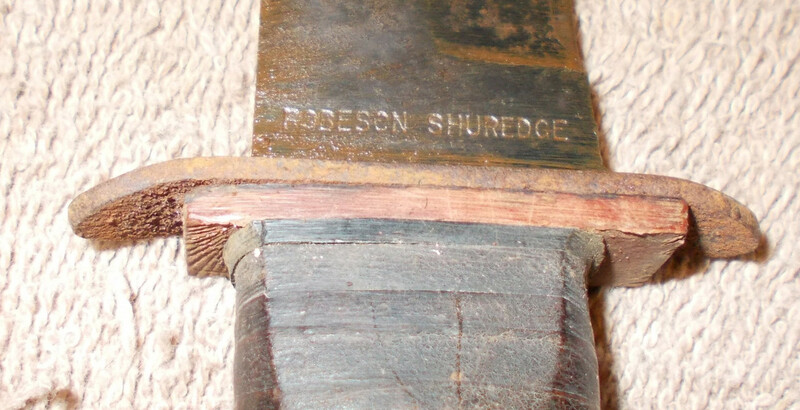 Robeson made the blade marked USMC knives before the guard marked USN models were made. KA-BAR and Camillus also had problems with the first model pommels breaking off and by the time they all got to the guard marking they had all gone to pinned on pommels. so one that's sterile other than the USN stamp on the ricasso would potentially be made by...?? I'm trying to find a on-line album, so I can post pictures. Knife is a little beat up. Father brought it back when he was in the service. OK, Lets see if the picture will post. Your photo shows well, but the photo of the whole knife is tiny. How about a photo of the whole knife not in the sheath?? By the way it looks like the proper original sheath too. Would be good to see a photo of the pommel area too.